The aim of the E-Galleries is to make visible the incredible variety of feminist media and artistic work that has been done. The selection of images is open: If you would like to add an image, please let us know! We consider the use of the images on this (non-profit, community) site as fair use". But if you do not agree and would like us to remove an image, please let us know (elke [dot] zobl sbg [dot] ac [dot] at). Ladyfest East Hampton 2001 took place from 24th to 25th of August 2001. Ten years later it happened again, April 2011. 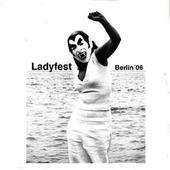 Ladyfest Bay Area (US, San Francisco) happened first from 24th to 28th of July 2002. It took place again in 2004, 2006 and 2009. 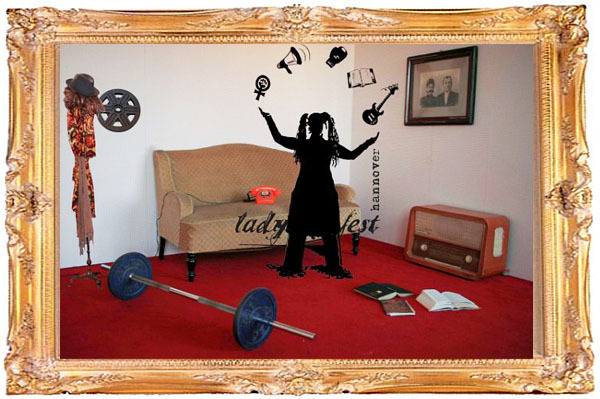 Ladyfest London happened first in 2002. It took place again in 2008, 2010 and 2011. "Female up" was the slogan of the first Ladyfest in Berlin. It happened in August 2003. Ladyfest Bristol happened first in August 2003. Ladyfest Devon happened two times: in April 2003 and in April 2004. 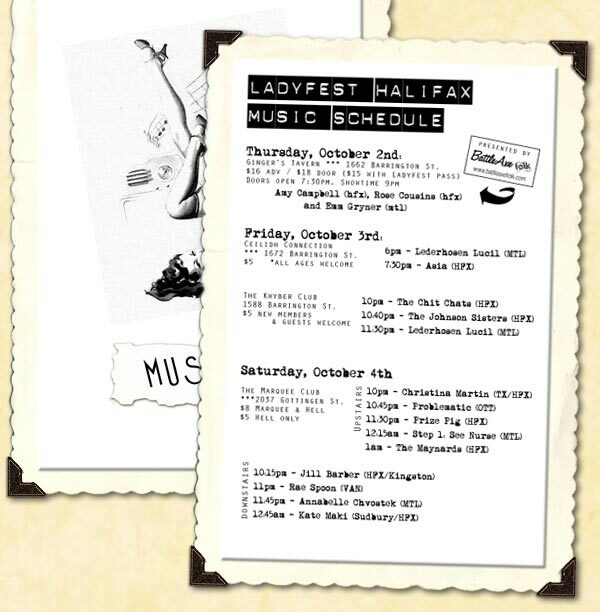 Ladyfest Halifax in Canada happened just one time. Ladyfest Hamburg took place in September 2003. Ladyfest Manchester happened first in September 2003. Ladyfest Austin happened twice:in May 2003 and in May 2004. The second Ladyfest in Berlin happened in August 2004. Ladyfest South (Atlanta) happened four times: in 2002, 2004, 2006 and in 2007. Ladyfest Warsaw happened first in November 2004. The first Ladyfest in Vienna happened in June 2004. Ladyfest Berlin happened ten times, the third time in August 2005. Ladyfest Brighton happened just once in the year 2005. Ladyfest Brisbane happened two times: in September 2005 and in November 2006. Ladyfest Dresden in Germany happened in July 2005. Ladyfest Durham (US, NC) took place in October 2005. Ladyfest Gothenburg happened four times: in 2005, 2006, 2007 and 2011. Ladyfest Hawaii 2005 happened from 3rd to 6th of March. 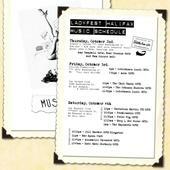 Ladyfest Humboldt (US, CA) happened just one time in April 2005. Ladyfest Spain in Madrid happened first in October 2005. Ladyfest Monterrey in Mexico happened first in December 2005. 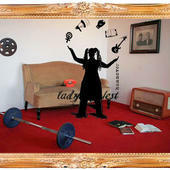 Ladyfest Napoli in Italy happened once in July 2005. Ladyfest Columbus (US, OH) took place two times: in May 2004 and in October 2005. Five years after the very first Ladyfest in Olympia Ladyfest Olympia ran a second edition in July 2005. Ladyfest Ottawa happened first in 2002 and was repeated annually until the year 2009. 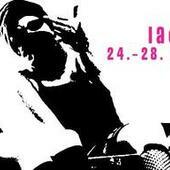 Ladyfest Timisoara in Rumania happened in May 2005. Ladyfest Singapore took place in August 2005. The second Ladyfest in Warsaw, Poland, happened in December 2005. The second Ladyfest in Vienna happened from 7th to 9th of October 2005. KuñaFest is the equivalent Ladyfest in Paraguay, Asuncion. It happened three times: one time in 2006 (22nd of July) and two times in 2007 (13th of October and 18th of November). 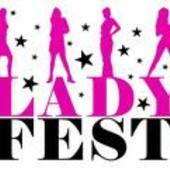 "Whatever your gender may be, if you feel like a lady, be part of ladyfest!" was the motto ot the fourth edition of Ladyfest Berlin which happend in August 2006. The first Ladyfest in Bournemouth happened in October 2006 and was part of Oxfam's "Oxjam 2006" campaign. Ladyfest Budapest happened once in March 2006. Ladyfest Cardiff happened from 29th of June to 2nd of July 2006 in Wales, UK. Ladyfest Frankfurt took place 24th to 28th of May 2006. The first Ladyfest in Hannover happened in September 2006. Ladyfest Las Vegas happened in July 2006. Ladyfest Malmö already happened four times: in 2004, 2005, 2006 and 2011. Ladyfest Music City happened in October 2006. Ladyfest Newcastle happened in September 2006.